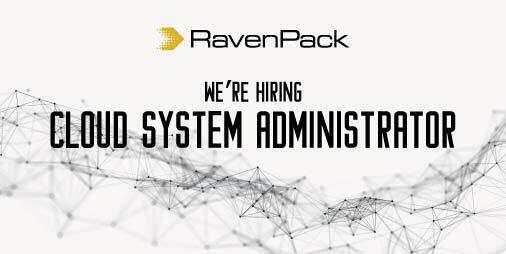 In RavenPack we are searching for a Cloud-experienced System Administrator (SysAdmin) to join RavenPack’s Operations Team. As a Cloud System Administrator (SysAdmin) you will be reporting directly to the Cloud Computing Manager and will interact with an international team of developers skilled in SQL, Python, Java, Common Lisp and Cloud technologies. You will be in charge of developing and maintaining cutting-edge cloud infrastructure solutions to provide support to the company’s services. Building, monitoring and provisioning software, automating infrastructure changes on the cloud will be part of your daily tasks. Continuously improving solutions based on clients needs. +2 years of professional experience as Linux Sys Admin. Demonstrable skills with scripting languages (Python, Bash) or equivalent technologies. Cloud and BigData technologies (Hadoop, Spark, ElasticSearch…). Database Administration (relational and NoSQL). Infrastructure as code technologies (AWS Cloudformation, Terraform...).